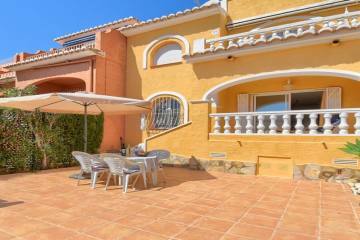 Villa in Pinosol Javea with views over Javea bay and only 2.5km from the Arenal beach. The villa build area is 218m2 standing on a plot of 764m2. The property consists of 5 bedrooms, 4 bathrooms, living/dining area and kitchen. Outside are two covered terraces, a summer kitchen and 8 x 4m swimming pool. Included is the refrigerator, oven, hob, microwave, dishwasher, washing machine, satellite TV, air conditioning and heating throughout the whole property.